Lawyer, Paul Magu is believed by police to have killed his wife, Lydia, and mutilated her body before committing suicide by throwing himself in front of a bus. Following the couple's deaths in Kenya, their 3 children, pictured above, have also been declared missing. Police say Magu may have killed the wife on November 23 in their house after he sent their house-help away. And after the woman was killed, her body was burnt outside their house and later stashed in a sack. The mutilated body of Wangui was found near Paradise Lost along Kiambu Road in Nairobi on November 24. 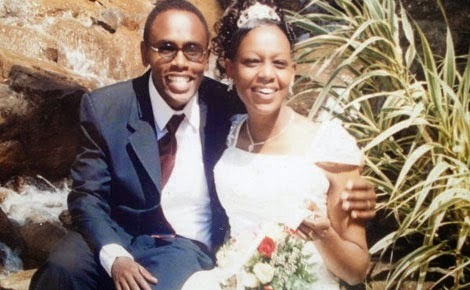 The body of Paul Magu, pictured above on wedding day with wife, was found a couple of days after he disposed of his wife on the Thika-Garissa highway on Wednesday where police believe he had committed suicide after jumping before a speeding bus, according to Standard Kenya. The day before he died, Magu spent the night at his father's home in Thika. Though he had left his home in Nairobi with his children, he was not with them when he arrived at his father's home in Thika, police said. According to his brother, Magu arrived at their home in Thika at about 2pm and held a brief talk with the parents before he excused himself and walked away. He returned about five hours later while wet, claiming he had been attacked by thugs and robbed of his mobile phone near a pond in his father's homestead. The mobile phone has however now been found near the pond and police think the children may be in the area. The family and police have since intensified their search for the missing children, concentrating on major dams in Kiambu and Thika. The family said they have also searched the thickets near where Magu's car was found abandoned before he walked to the highway. They have also searched mortuaries, dams and talked to the extended family and friends in a bid to find the children in vain. Magu's younger brother Andrew Kamau said before he died, Magu had contacted his lawyers to sign a will whose details he refused to divulge. 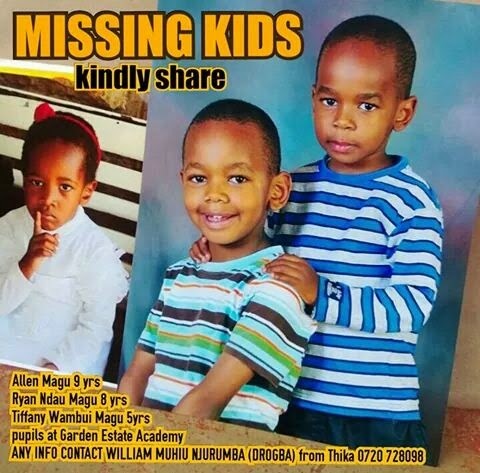 The children were declared missing after the bodies of their parents were found, and they were identified as Allen, 9, Ryan, 8, and Tiffany Muthoni, 5. Head of the Unit John Kariuki said they are yet to know the motive of the deaths and the link to the missing children. On December 1, one of the three missing children, Tiffany, was found murdered with her body badly mutilated and dumped in a coffee plantation in Ruiru, Standard reports. Police said they found Tiffany's decomposing body had a deep cut on the neck, but the fate of the other two children remains unknown. Meanwhile, the police now have a suspect and are holding a woman, Ann Wambui Wanyoro, who was arrested on Monday. The suspect was arraigned before the court by police seeking to hold her for 14 days for further questioning over the mysterious deaths. In a sworn affidavit, officer Maxwell Otieno said they believe she has crucial information concerning the murders. Ms Wanyoro is said to be a close family friend to lawyer Paul Magu and was consistently in communication with him throughout the period before and during the murder and even afterwards. "Even after the murder of the wife, the suspect spent time together with the deceased and visited various places together." The affidavit reads that under unclear circumstances, Magu had intended to transfer ownership of some of his properties to the suspect in a will deposited with John Odhiambo Achola advocates.